This tutorial will guide you through the process of changing the logo of your Joomla website. The process is easy and you will be able to complete it within a couple of minutes. 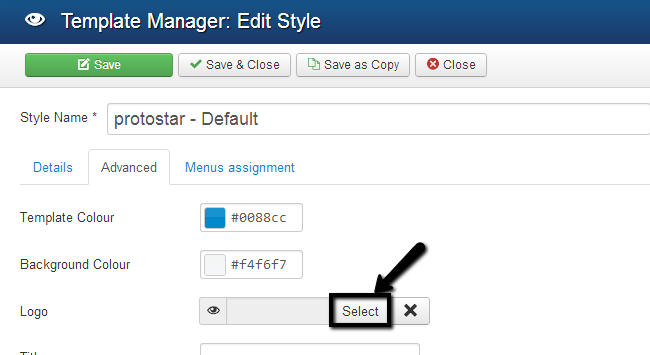 Log into your website as administrator and navigate to the Extensions tab on the top menu, then to Template Manager. First, click on the name of the template that is currently enabled on you website. In our case, this is the default Protostar template. Click on the Advanced tab and locate the Logo section. Then click the Select button next to it. Scroll down to the Upload file section. There you will be allowed to select a file from your personal computer and upload it to your account on the server. When you are ready uploading the new image file, it will be available within the list above the Upload file section. Select your logo image and click Insert to proceed. Click the Save & Close button to keep all changes. The system will complete the rest for you and when the changes are successfully completed, you will be able to see the new logo on the front-end of your website.